SERVING GREENVILLE, SPARTANBURG & UPSTATE SOUTH CAROLINA. Are you maximizing your investment's potential? South Carolina provides a range of rental opportunities to working professionals, families, senior customers who are looking for the perfect place to begin their retirement, and overseas employees working at some of the largest corporations in the nation. When you want to enjoy everything that The Palmetto State has to offer, hire the reliable property management services offered by ABOVE Property Management. 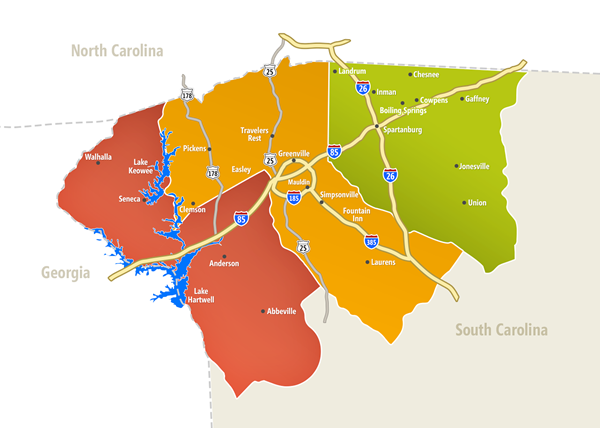 ABOVE Property Management provides residential single-family homes to tenants in the areas of Greenville, Spartanburg and The Upstate region. We help tenants locate the right rental unit that fits their lifestyles and their budgets. Then we keep the residence in top condition while giving the tenants the desired management services that will make them want to sign long-term leases. In addition, we also work with property owners to bring the best value to your real estate investments. We will become your cost-efficient resource that can handle all the rental management services on your behalf so you can maximize your investment returns. Contact our helpful staff today to find out how we can help you with our property management services.